This song was written by Steve and another friend of his (if I could remember his name, I'd give him credit). Me (guitar, vocals); Jim (Drums); Steve (lead guitar); and Joe (Bass). This was our most requested song when we played shows. 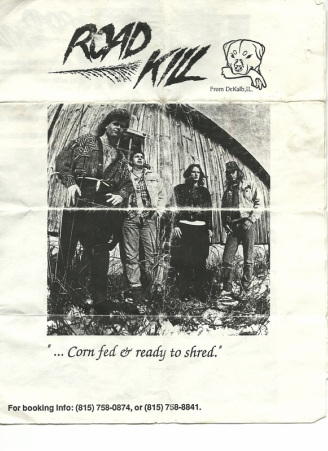 Road Kill was my first real band and became official in January of '91, and disbanded in the summer of '92 after enjoying some decent club success.The band consisted of me (guitar, vox; Steve Werthe (guitar); Jim Nevel (Drums); and Joe (Joey Bag O' Donuts) Delboccio (Bass). In this photo (from L to R): Me, Joe Delboccio, Jim Nevel, Steve Werthe. Photo was taken in a rural part of Northern Illinois (about an hour from Chicago) by Steve Lopes. The logo was designed and drawn by Chris Pearson. 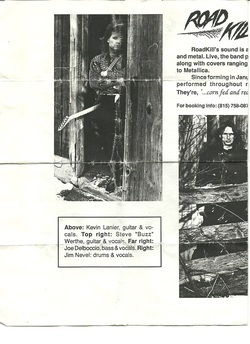 *There were a half a dozen or so songs called the "Sanitarium Songs." Our drummer, Jim Nevel, actually used to work graveyard shifts at a sanitarium, and would take his drumsticks and an old-school tabletop-tape recorder to work with him. He could hear entire songs in his head, but could not write, read, nor even describe music. While at work, he would drum out an entire song--from start to finish--using textbooks and pillows, and record them onto the tape recorder. He would later hand me a page of lyrics and the tape, and it was my job to construct the song. I would come up with different guitar variations and he wuold tell me when I had the right one (what he was hearing in his head). 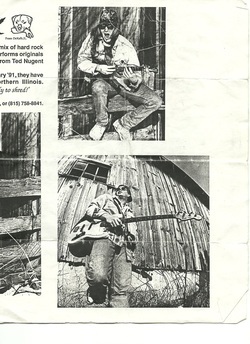 --These songs were recorded at the Noise Chamber in Loves Park, IL. I actually got to meet Bun E. Carlos (Drummer from Cheap Trick) that day--he was coming in to record some tracks just as we were packing up to leave. All in all, that was a pretty cool day.